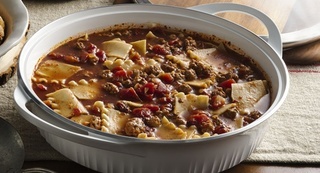 We asked 25 FBC Members to come up with a variety of comforting and holiday-inspired recipes to showcase CW by CorningWare. In part 1, we showcased 5 sweet recipes featuring the flavours of Autumn like apples and pumpkin. Up next are 5 dreamy pasta dishes that are sure to satisfy the entire family for dinner and probably have some leftovers for the next day! Don’t forget to RSVP to our #CorningWare Twitter Party on November 18th, 2015 at 6pm PT/9PM ET for a chance to win some terrific CorningWare packages!